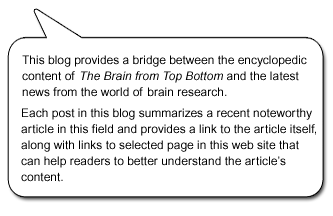 The Brain from Top to Bottom Blog – Intermediate Level » What’s running our show? Deric Bownds, director of the Biology of Mind program at the University of Wisconsin-Madison, recently gave a lecture at this institution’s seminar series on chaos and complexity. The lecture was entitled “Upstairs/Downstairs in our brains – What’s running our show?” (You can find the full text by following the link at the bottom of this post.) Its subject was the increasingly common distinction, in the literature on the brain, between bottom-up and top-down control. This literature also employs other metaphors for opposing processes in the brain, such as the famous System 1 (fast and unconscious) versus System 2 (slower and conscious), the “upstairs/downstairs” metaphor in the title of Bownd’s lecture, and the distinction between the attention network (the parts in blue in the illustration here) and the default mode network (the parts in orange). In his lecture, Bownds discusses numerous experimental results that all point to what is really a fairly simple idea: as human beings, we spend much of our time in one or the other of two major mental states that are opposed to each other and, in a sense, mutually exclusive. In one, our minds are assaulted by the countless stimuli from our environment (which have only grown, in this age of smart phones and social networks), and our default mode network then plays back excerpts from this film of our personal and social lives when it has time to do so. In the other, through the frequent intervention of the frontal regions of our cortex, we concentrate our attention on cognitive problems in order to solve them. Both of these two major modes of mental functioning no doubt serve useful purposes, because both are products of the evolution of our species. But while each of these modes provides fairly obvious advantages, each also has a dark side that becomes apparent when it is overactivated. On the one hand, if your attention network exercises too much control, it can inhibit your spontaneity and creativity, and you may become a “control freak”. On the other, although your default mode network can help you incubate creative ideas, consolidate and retrieve personal memories, and simply plan your day, many studies show that this network can also cause you to brood over all kinds of dark ideas, often predisposing you to anxiety, attention deficits, or depression. Bownds goes on to suggest that in modern life, we tend to react a bit passively to our environment, focusing our inner discourse on whatever that environment suggests. But sometimes we catch ourselves and decide (more or less consciously—that’s a matter of some debate) to focus our attention on what we consider more significant for ourselves. And as Bownds demonstrates with several examples from the literature, certain practices, such as meditation or cognitive therapy, can help tip the balance between these modes in favour of greater control by the attention network. In other words, these practices can give us the mental weapons of self-defence to survive in the jungle of media and advertisements that assault us every day. I would submit that those mind therapies, meditations, or exercises that are the most effective in generating new more functional behaviors are those that come close to resolving what we could call the category error (in the spirit of the philosophical term) in considering mind and brain. And, that error is to confuse a product with its source, the source being the fundamental impersonal downstairs machinery that generates the varieties of functional or dysfunctional selves that are its product, that we mistakenly imagine ourselves to be. Mental exercises like meditation permit the intuition of, perhaps come closest to, that more refined metacognitive underlying generative space that permits viewing of, and choice between, more or less functional self options. Upstairs/Downstairs in our Brain – What’s running our show?